Come explore East TN from the RV Park closest to the center of Knoxville! 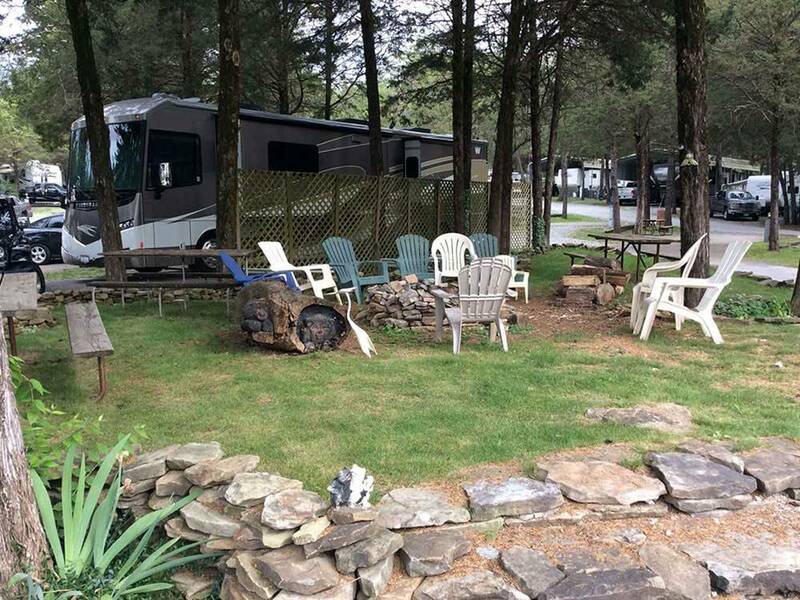 This owner-operated family campground is open all year and welcomes everything from tents to big rigs! Our family welcomes your family! We were traveling in a 40' class A (along with another family in a class C) and were staying there to explore Knoxville for a few days. The staff was actually very friendly and polite. Check in was easy and the shop had a good selection of basic camping/rv supplies. Pool was small. Playground was small but not bad for young kids. However, the drive to our site took us through the permanent section with the many old, very poorly maintained campers. The open sites border the permanent section. Semi flat concrete pads under pine trees. The residents appeared to be friendly and greeting but ended up hovering all night and trying to sell us supplies. There was a very extreme discomfort with the permanent residents. Our wives were unsettled the entire time we were there. I wish there would have been a review to warn us before setting up with our families. I would recommend that you find another place to stay. Definite parking lot-type campground! The store/check-in area looks cute and is well stocked, but the 30 amp/water service area STINKS! Very un-level sites, looks trashy and speaking of which, there is constant big truck noise right behind our site from the trash processing facility not more than 100 yards from where we're parked. If you like parking/camping while listening to constant truck backing up beeping, scrapping and banging noises, then you won't mind this. Sadly, this is the trashiest camp site we have ever paid for. Very disappointing. My wife and I traveled from Oregon to Florida and back again, staying at numerous RV parks. This park was without question the WORST park we encountered. In fairness, I must state that unbeknownst to us at the time, we were placed in an overflow spot. When calling ahead, my wife was told that they only had water/electric spots available, which was OK with us. At check-in, we were given a park map and told to take our pick of several available spots in a particular location. The spots were at the back of the park, tucked among the trees, on a hill that made it extremely difficult to park our MH and virtually impossible to get it level. We were finally able to access a spot only due to the kind assistance of a fellow RVer (who was forced to park his Class A at the top of the hill w/o any hookups). The restroom/shower area's lack of appeal was only somewhat overshadowed by their filthiness. There was a Waste Management facility behind our location, and their trucks began rolling at 3am, making it very difficult to sleep. Sites in the main section of the park have concrete slabs and that area had a much more pleasant appearance. However, the staff should both inform potential patrons when only overflow sites remain, but describe the conditions of those sites. Little contact with staff but they were friendly. Very easy access to the interstates. Great American history with Oak Ridge National Lab nearby. Do the 3 hour bus tour if you can make it. Really worthwhile if you like history. They basically ended the war there. Pretty impressive when you. Insider how slow things move now. Park was great for a few nights. Long term? Very friendly staff. Easy layout to get around in, but not too "structured" (meaning perfect rows of parallel parked RV's). Only stayed one night, but liked parking amoungst the trees rather than just a token tree here and there. Appeared to be quite a few "long term" residents. Very friendly and helpful. Easy off I 75 heading south. Did not use facilities, stayed in our RV. Our site was pull through easy in easy out. Pulled in and stayed just for the night. Easy access from I 75 with a very user friendly staff. Went out of the way get my cable tv operating. Would stop again. Pretty rustic. Gravel roads are pretty narrow. Bath house was clean. Not very close to anything except the Interstate.